Women’s Squash Night in New York always brings out a little craziness! Over an Oktoberfest beer the other evening, a friend remarked to me, “we’re the only women I know who still play the sport we played in college.” My friend plays tennis and I play squash, and I feel incredibly fortunate I couldn’t say the same thing. She lives out west in a place where there aren’t that many organized sports for women. Whereas I live in a city with New York Squash—an organization that has facilitated competitive squash long before I moved here, and increasingly encouraged and supported women’s squash. So I have lots of friends who play squash….and every year I seem to find a few more. Autumn is often the best time. 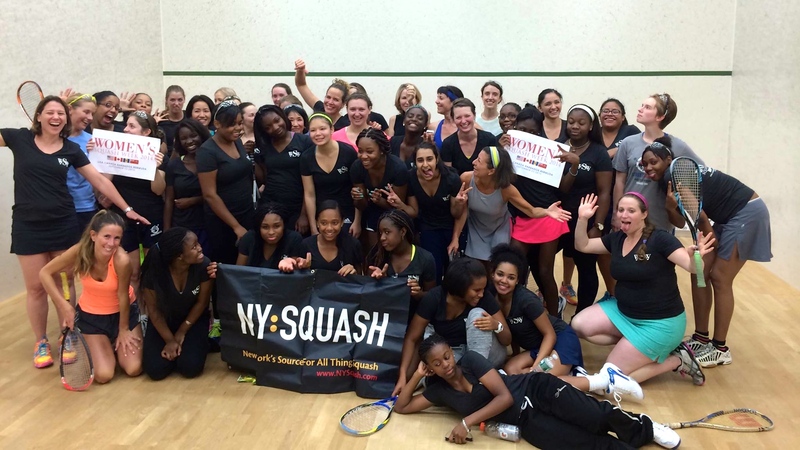 Thanks to two New York women, Emily Stieff and Jessica Green, Women’s Squash Week was born in 2008 and has hosted an evening of female squash camaraderie at the beginning of squash season every year since. And it’s spread to other cities and countries. Why do we need Women’s Squash Week, you may ask? Well, if you’re a female squash player in NYC, it’s probably already obvious to you that men outnumber women something like 10 to 1. The reasons why could fill a few more articles, but it always helps to know that there are others wearing sports bras and swinging racquets out there and where to find them. 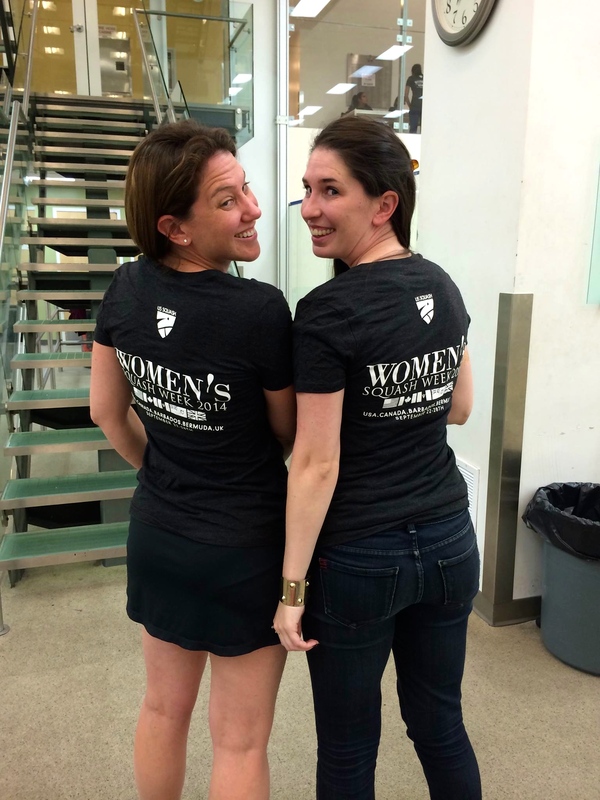 That, and the Women’s Squash Week t-shirts are always cool. Personally, it’s a rush to arrive at the SL Green StreetSquash Center on the evening of the WSW event, look down on the eight glass-backed courts and see around fifty women and girls swinging their racquets and playing Queen of the Court. Some look like they’ve just stepped off their college courts and some clearly have seen a few seasons since, but some are just starting out on, hopefully, long squash lives of their own. While courts are divided according to ability, it’s always heartening to see a veteran hitting with a newbie. That’s true squash camaraderie. 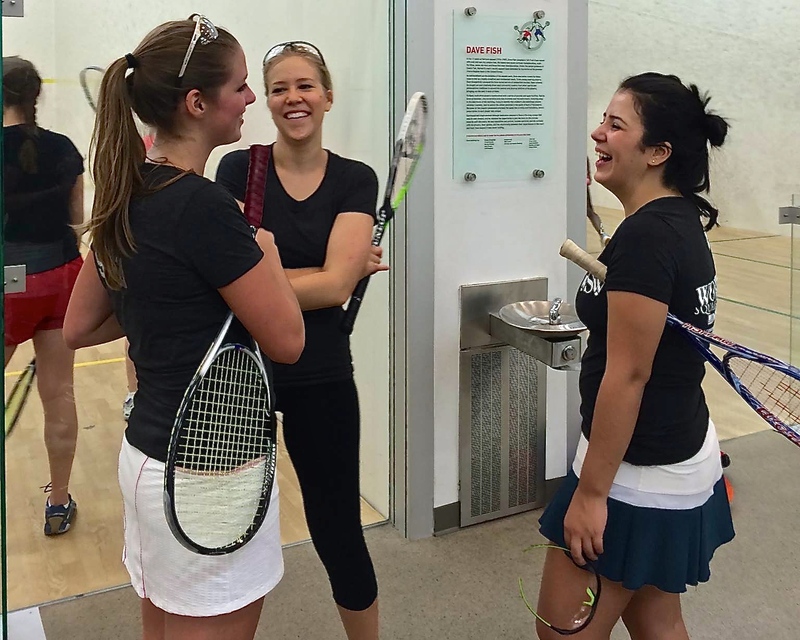 Besides, the real purpose of Women’s Squash Night is to make connections—between players who have lost touch, players new to the city who want to find a place to play and a league team to play on, and beginners who want to find others as excited as they are to learn this great sport. Squash may be one of the most aerobic, strategic, and fun games you could ever find to play, but it’s also about being part of a community. And Women’s Squash Week reinforces that. At the end of the evening it’s a tradition to gather for the NY Squash Women’s Squash Week picture. Everyone’s a little sweaty, our hair up in ponytails or held back with bandanas, our new t-shirts sticking to our skin, but we’re happier and more relaxed. We have a new or old friend to call for a game, a name of a pro who would be good for lessons, a round robin we might try out. And I myself leave glad that I live in New York City and have so many friends who play the sport I played in college. 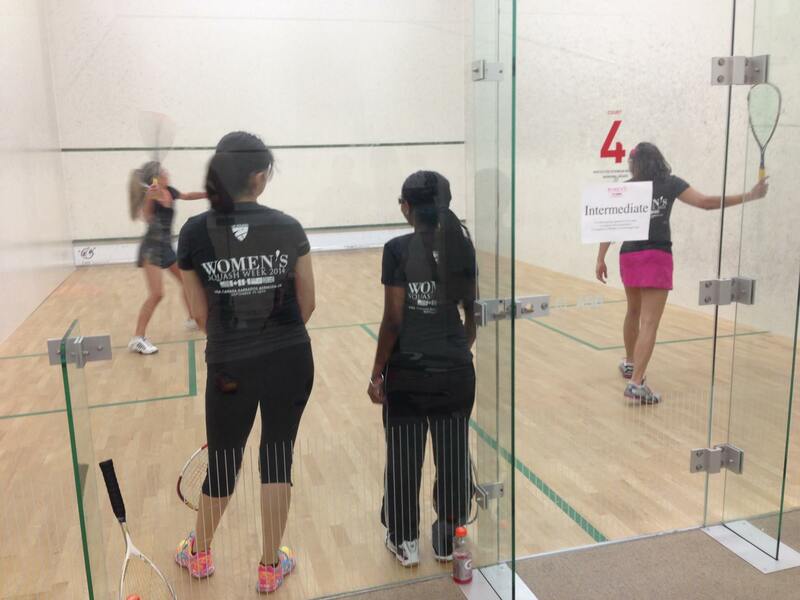 More photos of NY Squash’s Women’s Squash Night can be found on the NY SQUASH facebook page. For more information on where to play squash in NYC, go to NYSquash.com. This entry was posted in squash and tagged New York, nyc, NYSQUASH, squash, squash player, women, Women's Squash Week. Bookmark the permalink.